Madagascar is a film about Marty the Zebra and his escape from the New York Zoo. His friends plot their own escape to bring him home, only to find themselves being shipped to a preserve in Kenya when the zoo keepers are convinced that the animals are all unhappy. A few conniving penguins change their destination to Antartica and the group finds themselves stranded on an island. In Madagascar 2 the quartet tries the opposite, to escape from Africa and make it back to their zoo in New York. This too go awry as the friends find themselves stranded in an animal preserve. Madagascar is a film centered on Marty the Zebra and his friends Alex the Lion, Gloria the Hippo and Melman the Giraffe. Marty decides that he is going to escape from his home at a zoo in New York. Alex, Gloria and Melman chase after him, escaping themselves, in order to bring Marty back. But the damage is done, the zoo keepers believing that the animals are unhappy at the zoo. The creatures all are scheduled to be brought to a preserve in Africa. They don’t get very far before a squadron of penguins commandeers the plane and sets course for Antarctica before crash landing on an island. There they meet the lemurs and the lemur king and learn about the food chain making for a collision of predator instinct and close friendship. 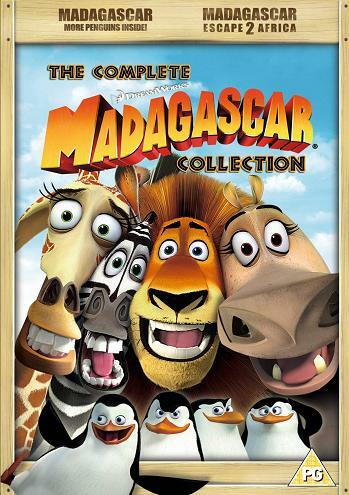 Madagascar: Escape to Africa, the sequel to Madagascar begins with a similar plot. This time the quartet is trying to escape from their new home in Africa to return to the zoo they originally came from in New York. Another attempt at flying the plane results in the group once again stranding themselves, this time in a preserve on the African plains. Alex learns that this is where he was born. His father is still the alpha lion though is uncle is seeking to take over. More fish out of water type comedy and comic lines ensue in this Madagascar sequel.